Germany eased past a 10-man Portugal, winning their World Cup Group G match 4-0, at Arena Fonte Nova in Salvador, on Monday. The one-sided result kept intact Germany's record of never losing a match after scoring the opener since 1994, when Bulgaria upset them in the quarters. Portugal's misery was compounded when defender Pepe was sent off after 37 minutes for pushing his head into Thomas Mueller as the German sat on the ground following a foul. Muller went on to score three goals, his first international hat-trick, and only the second of the last three World Cups. It is the 49th hat-trick in World Cup finals history and takes Mueller's goal tally for his country to 20. The Bayern Munich star put Germany ahead with a penalty in the 12th minute. 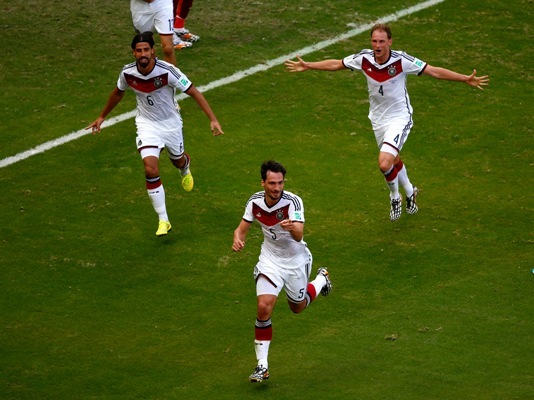 Germany's second goal also came from a dead ball situation, Mat Hummels getting on the scoresheet. The Borussia Dortmund defender headed home Toni Kroos's corner from six metres after 32 minutes. Making matters worse for Portugal was the third German goal that came just before half-time. Mueller, who won the Golden Boot four years back in South Africa, got his name on the scoresheet again. In the process, he took his tally in the World Cup to eight goals, with his third of the match, in the 78th minute. The last World Cup hat-trick was scored by Gonzalo Higuain of Argentina against South Korea in 2010. Before that, Pauleta of Portugal notched a treble against Poland in the 2002 finals. Karim Benzema came close to three goals for France on Sunday, scoring twice and seeing a shot come off the post before hitting the Honduras goalkeeper to go in for an own goal. 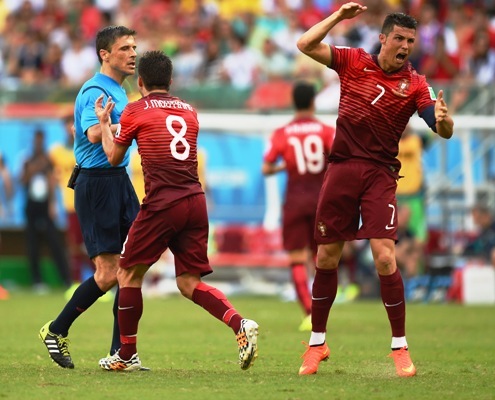 Fit-again Cristiano Ronaldo, having recovered from a left knee problem, started up front for Portugal. In fact, coach Paulo Bento named forwards Hugo Almeida and Nani to play alongside the World Player of the Year, but all three failed to impress.